My beloved father recently came to visit me in L.A. Prior to his trip, as I’d been wanting to see it, I asked if he’d have any interest in seeing IRIS, the Cirque du Soleil show currrently running here, to which he gamely replied “Let’s go to the circus!” 🙂 And so we did! 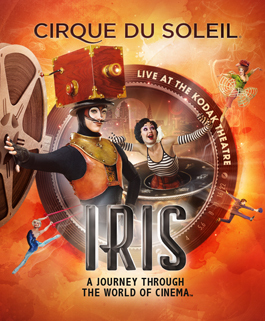 IRIS, (a reference to the human eye and a metaphor for the camera’s lens) is Cirque du Soleil’s homage to film ~ a “Journey Through the World of Cinema”. 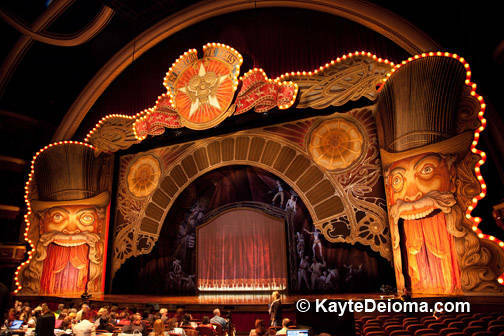 It is an audio-visual feast for the senses, fittingly being performed in the heart of Hollywood at the Dolby (formerly Kodak) Theater, the current home to the Academy Awards, just a stone’s throw from Grauman’s Chinese Theater and the Hollywood Boulevard Walk of Fame. It is a beautiful theater in and of itself, and it is extra special to be IN the space where the Oscars are held. It’s great fun to browse the larger-than-life black and white photos from Oscars past that adorn the walls outside the theater entrances…and it’s easy to imagine the buzz of excitement there when the halls are swarming with the film industry elite every February. The rest of the year (and for the next 10 years to come! ), it is home to the magical, mesmerizing ~ and magnificent ~ IRIS. 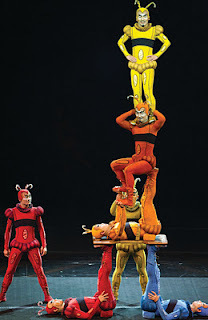 For anyone who has seen a Cirque du Soleil show, you know that Cirque takes “the circus” to a whole new level. 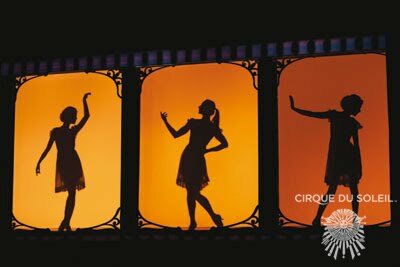 I’ve seen two other Cirque shows, including “O” in Las Vegas, (which is water-themed and also quite amazing), but this was my favorite yet. While I acknowledge, film lover that I am, that the theme of this particular show may have had something to do with that, I’m confident one needn’t be a cinephile to fully enjoy and appreciate it! It is a combination of many elements that serve to make IRIS the uniquely spellbinding spectacle it is. Chief among them are the mind-boggling performers. The level of strength, control and skill they exhibit is astonishing, whether they are working in conjunction with one another to build sculptural human towers with their incomprehensibly strong bodies, gliding through the air on swings or wires high above the audience, contorting their shockingly lithe bodies in ways you never dreamed possible (they may indeed be super-human ~ that, or their spines are made of rubber), or balancing the entire weight of their body on a 3″x5″ rectangle atop a post several feet off the ground. It very often defies belief at the same time that it takes your breath away. They make it look so effortlessly graceful, so deceptively easy (but we know better). The acrobatics never fail to stun, stupefy and scintillate. For the majority of the show, both my and my father’s eyes were wide with amazement, our jaws dropped in awe. There are numerous sequences I could watch over and over. Standouts include a set of trapeze-artist twins flying and swinging gracefully through the air above us, the Snake Women (see photo above ~ living versions of Gumby, if you recall his ability to bend into any imaginable shape), and perhaps my favorite of all, the Film Noir/ Rooftops segment that incorporates trampolines into a set of L.A. skyline rooftops that is some of the most captivating, innovative and energetic choreography I’ve ever seen. 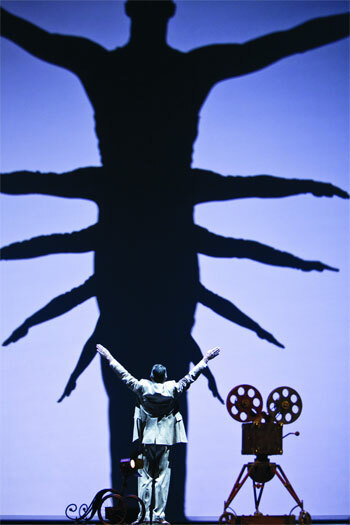 There is wonderfully creative use of lighting and live screen projections throughout the show, which not only serves to illustrate the various forms of motion capture over the years, but also greatly enhances many of the acts through shadow, light, color and effects. 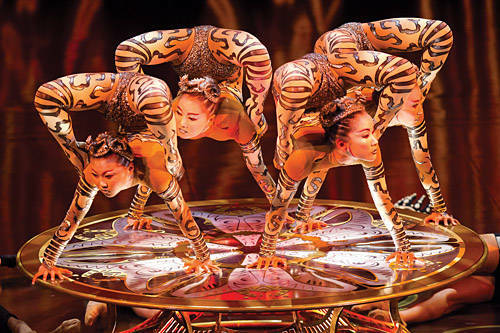 The costumes are also dazzling ~ brilliantly colorful and wildly imaginative. It is honestly at times a challenge to determine where to train your eye, there is so much happening at once, so much to take in. (Which is by no means a criticism, for it is a welcome challenge!) I’m certain one could see this show half a dozen times and notice something new with every viewing. All of this splendor is tremendously supported by film composer Danny Elfman‘s resplendent score, which encompasses a remarkably broad range of sounds, moods and even musical genres (and which is performed by live musicians). Elfman is clearly able to tackle anything and hit the perfect pitch, whether it’s mimicking the jaunty piano-heavy days of silent film or the more blues and jazz-influenced film noir. Every piece is made all the more mellifluous by the extraordinarily high-quality sound system in the theater ~ apparently there is very good reason the theater is now named Dolby (after Dolby Sound). 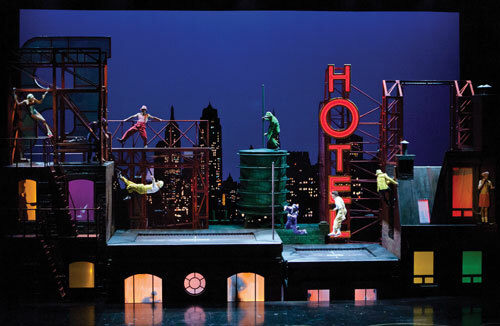 Plenty of humor is scattered throughout, some coming before the show even starts, with company members out among the seats, playfully interacting with audience members. If I were to have any criticism, it would be that some of the little “comic interludes” (which I assume allow for costume and set changes) are a bit odd and disconnected, though certainly more entertaining and enjoyable than the comparable clown-themed bits in “O”, which I found annoyingly unfunny and even more disconnected. Also, the show follows no clearly laid out progression or story arc on the history of film…but even so, I was hardly bothered by it, because what IS there is so fully entertaining, engaging and compelling. *One final note: You can purchase discounted tickets directly through Goldstar (click to be sent directly to the IRIS page). The one caveat of going through Goldstar is that you can’t choose your seats, though ours could not have been much better, so if that’s any indication of the quality of seats Goldstar purchases, it seems worth the risk if you’re looking to save! This entry was posted in Theater and tagged Academy Award, Acrobatics, Circus, Cirque du Soleil, Danny Elfman, entertainment, Grauman's Chinese Theater, Hollywood, Iris (Cirque du Soleil), Los Angeles Theater, Oscars by Missy Krehbiel. Bookmark the permalink.